Today DarkGlovy has updated his PC Tool named DarkEBOOT Fixer to version 3.5. If you are unsure of what this tool I'll explain. 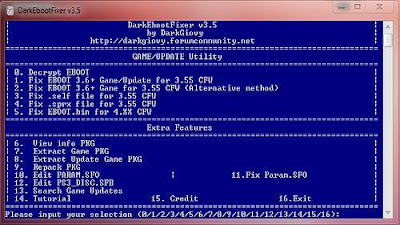 This tool is capable of taking an original 4.21 EBOOT.bin (PS3 Game File signed with 4.21 keys) resigning it to play it on a more stable CFW build such as CFW 3.55 kmeaw. Check out the changelog and the download link below. * The pack contains 2 Exe tool, one in English and one in Italian.